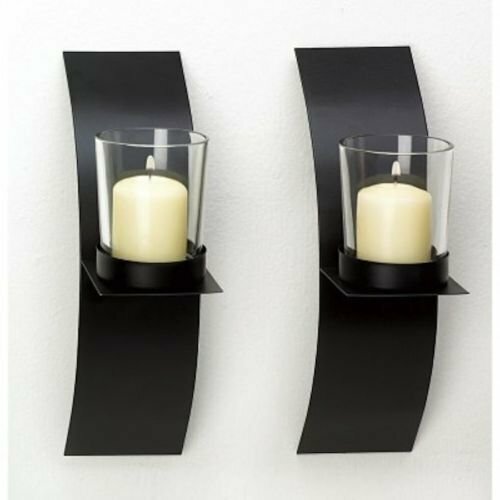 Add a chic, modernistic look to any room with this striking pair of candle sconces! Matte black finish lends drama to slender curved metal wall plaques, each supporting a clear glass votive cup. Why not add your favorite brightly-colored candles for an ultra-artistic display? **Candles and hardware not included. Each is 2 3/8" x 4 3/4" x 8" high. View More In Candle Sconces. If you have any questions about this product by khonanpai, contact us by completing and submitting the form below. If you are looking for a specif part number, please include it with your message.